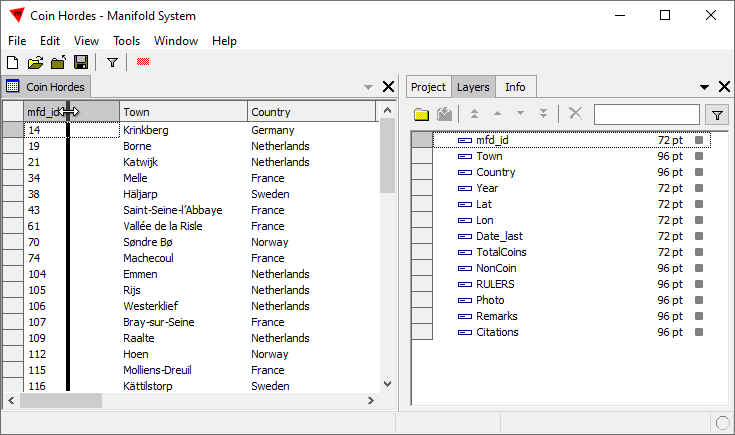 The Layers panel of the Contents pane lists all layers in a window and provides basic controls: we can alter the order of layers in the display stack, to change layer opacity, and turn layers on and off. The Layers panel also allows us to specify the background color of a window. 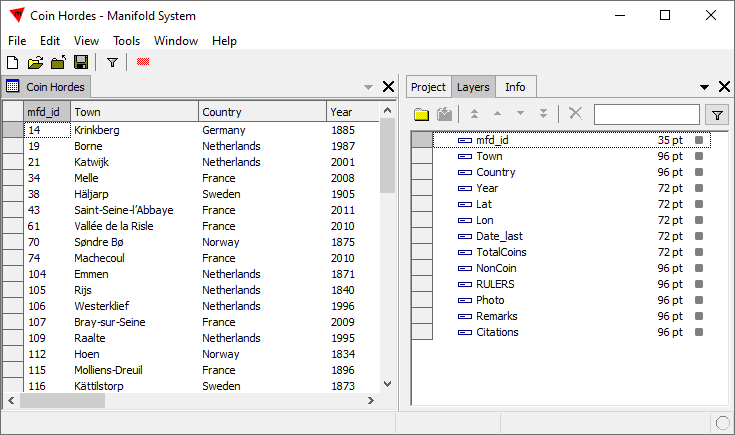 The Layers pane also controls the order and appearance of frames in layouts and columns in tables. 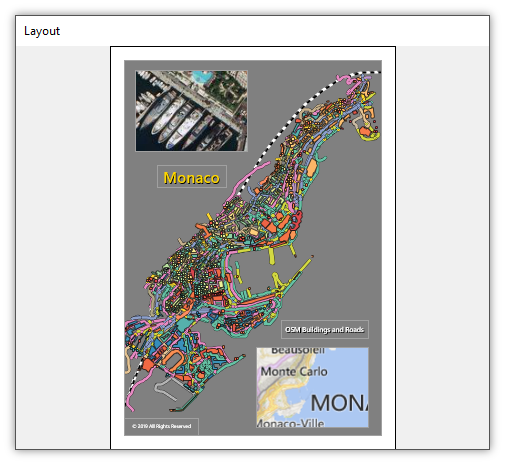 Open the Layers panel in the Contents pane by pulling down the panel menu and choosing Layers. A keyboard shortcut of Ctrl+2 also switches the Contents pane to the Layers panel. 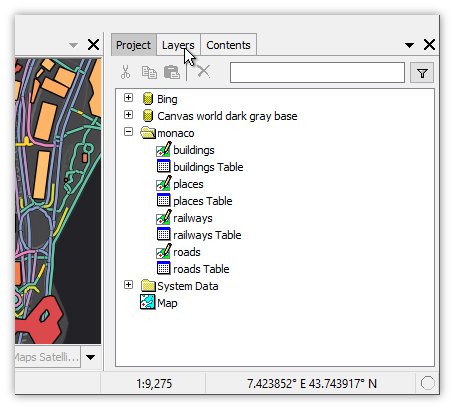 In addition to the layers tab strip at the bottom of a map window the Layers panel is our primary interface to see what is in the window and to manage layers. 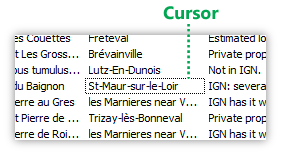 The list shows the display order of layers in the window, with higher layers in the list rendered above lower layers in the list. A "virtual layer" called the Background appears at the bottom of the list to allow us to control the background color of the window and to turn background color off and on. With layouts the Layers panel controls the vertical placement of frames in the display stack, their transparency and whether they are on or off for display. 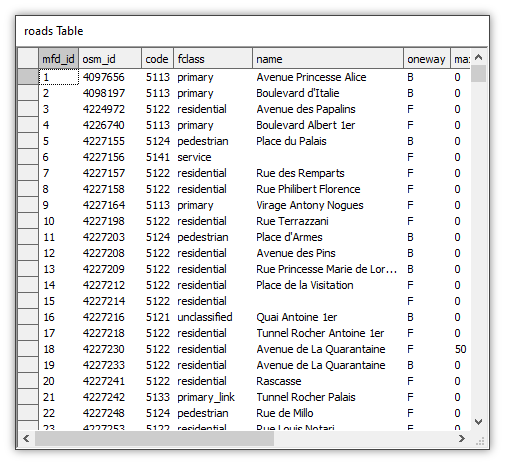 With tables, the Labels panel controls the horizontal placement of columns in the table, their width and whether they are on or off for display. The Layers panel shares many of the same controls as a table. For example, the keyboard arrow keys move the current cell, indicated by a dotted outline, up and down, left and right. 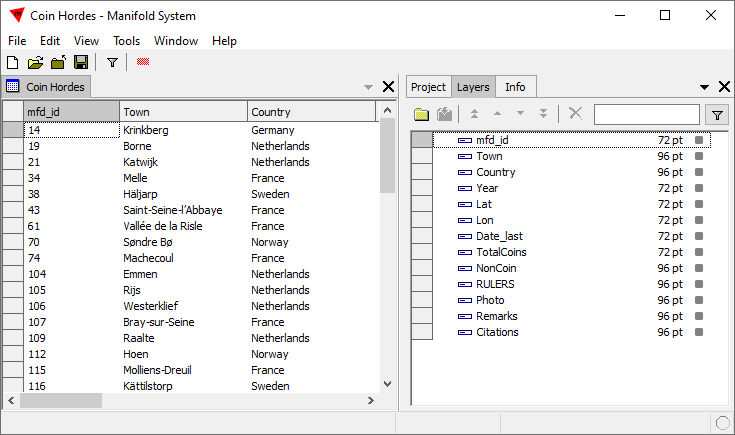 Layers can be selected just like rows in tables can be selected. For a step-by-step illustrated tutorial to the Layers panel, see the Example: Layers Tutorial topic. The toolbar at the top of the Layers panel is enabled when one or more layers have been selected by Ctrl-clicking a layer. The move commands are not enabled if there is only one layer, nor are they enabled when only the Background is selected. The Delete button is not enabled for the Background and it is not enabled when one layer remains in a drawing, image or labels window. Current item - The cursor (dotted outline) indicates the current item, for example, the current cell in a table or the current row in a list. Click on an item to make it the current item. Only one item can be the current item at a time. Move the cursor from item to time using the controls listed below. Selection - Red background indicates a selected item. Ctrl-click an item to select it or to de-select it. More than one item can be selected at a time. Ctrl-click on a layer to select it or deselect it. Double-click onto a layer to toggle it on/off. Double-click into an opacity % setting or into the background color well to change opacity or color. Delete all selected layers from the window. We cannot delete the Background from a window. This does not delete the components from the project: it only removes them as layers from the window. 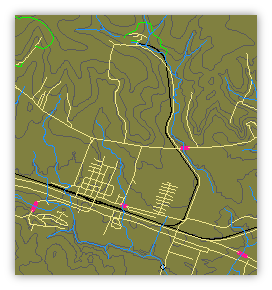 If a map has one layer we can delete that to leave a blank map. However, with only one layer in a drawing, image or labels window we cannot delete the defining layer from its own window. Opacity of a layer in percent. Double-click into the opacity % setting to change the opacity. Applies to all selected layers. Layer off (empty box) or on (filled box). Double-click a layer name or the on/off box to toggle the layer off and on. Applies to all selected layers. Color well showing the background color. Double-click into the color well to change the background color. Move buttons will move all selected layers together. 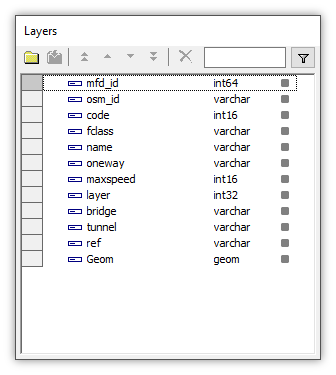 Selected layers need not be next to each other in the stack to be moved in the same relative direction up or down. Commands will have no action on layers for which they are impossible. For example, if several layers are selected and one of them is the lowest layer in the stack then that last layer will not move on a Move down command while the rest the selected layers will move down one step. Experienced users working with many layers report it is often much quicker to use the keyboard to toggle layers on/off, to select layers, and to move selected layers up and down. Ctrl-A is Select All, to select all layers. Ctrl-I is Select Inverse, to invert the selection. A quick way to de-select all layers is to do a quick Ctrl-A followed by a Ctrl-I. Select / Deselect current layer. Move selected layers up or down in the stack. Control current cell: Toggle current layer on/off or begin editing opacity. Move current cell cursor up / down / left / right. Move current cell cursor all the way to the left (layer names). Move current cell cursor all the way to the right (on/off box). Move current cell cursor to the top layer. Move current cell cursor to the bottom layer (Background). Move current cell cursor up or down one page's worth. A vertical scroll bar appears when there are more layers than can fit into the display. Scrolling the display does not move the current cell cursor. Scroll Here - Drag the scroll bar handle to the spot right-clicked and scroll the display accordingly. Top - Scroll the display to the top. Bottom - Scroll the display to the bottom. Page Up - Scroll the display up one page. Page Down - Scroll the display down one page. Scroll Up - Scroll the display up one row. Scroll Down - Scroll the display down one row. 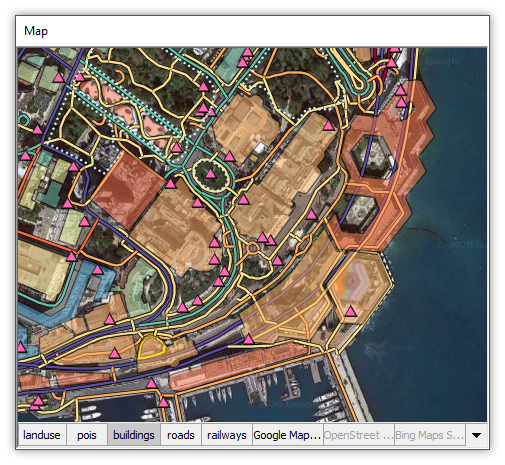 Controls such as opacity, the layer on/off boxes or various Move Up or Move Down controls apply to all selected layers. This allows us to apply the same settings or action to many layers at once. Selecting more than one layer is a convenient way of moving more than one layer up or down, simultaneously changing the opacity of multiple layers at once and so on. When there are many layers in a window it can be much quicker to turn layers off and on by using the Layers panel instead of double-clicking tabs in the tab strip of a window. Clever use of Selection with Ctrl-A to Select All and Ctrl-I to Select Inverse can greatly reduce the number of clicks. We want to turn on all layers except four layers. We select the four layers we want off and double-click as needed one of the layers to turn all four of those layers off. We then press Ctrl-I to invert the Selection and double-click as needed one of the layers to turn on all selected layers. Done. With the focus on the opened table, choose the Layers panel to manage which fields appear in a table and the column widths used for each field. 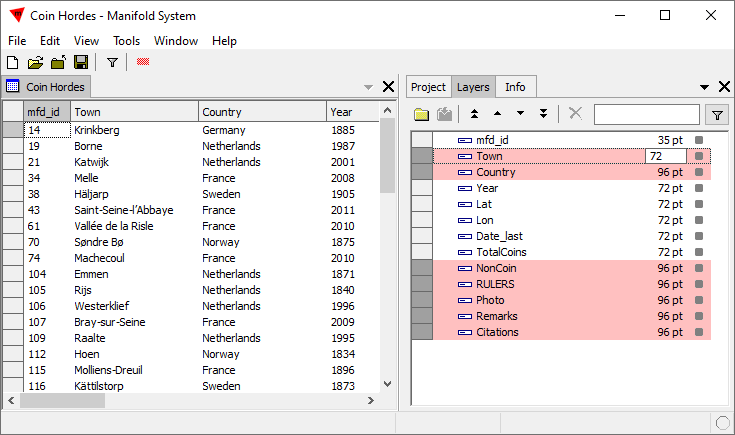 Change column width - In the table window, drag boundaries between columns to the desired width, or in the Layers panel double-click into the point size cell and change the number to the desired width in points. 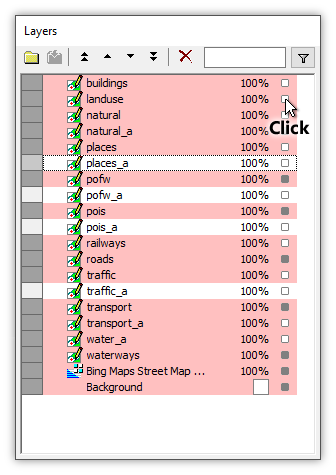 Hide or show columns - In the Layers panel double-click the small box to toggle a column off and on. Change order of fields - In the Layers panel, Ctrl-click a row to select it and then use the Move Up and Move Down toolbar buttons to move it. The display above shows a table with 13 fields that is open on the left side of the desktop with the Layers panel open on the right side of the desktop. We can adjust the width of a column by either double-clicking into the numeric width of the field, for example, changing the 72 point default width of the mfd_id column to, say, 38 points, or by dragging the column's border in the table. We can adjust the width of a column by either double-clicking into the numeric width of the field, for example, changing the 72 point default width of the mfd_id column to, say, 38 points, or by dragging the column's border in the table. If we drag the border of the mfd_id column to make it a narrower column the point size readout in the Layers pane will automatically be updated. To hide a field, double-click the small box at the right to toggle it off/on. In the illustration above we have hidden the Country field. To change the order in which fields are displayed, Ctrl-click the row for that field in the Layers panel to select it, and then use the up and down arrows to move the field up or down in the list. 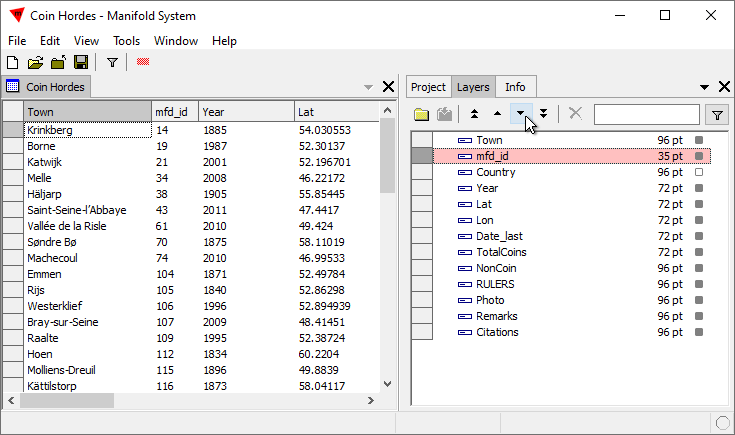 In the illustration above we have moved the mfd_id field down one row, so that it displays between the Town column and the Year column in the table window. 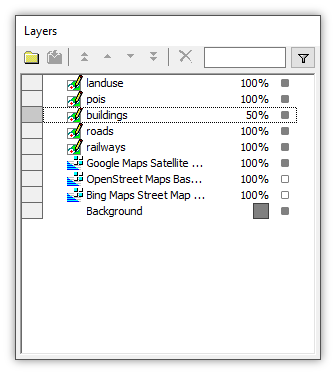 As with layer characteristics when the Layers panel is used with maps, a change will apply to all selected rows. If we select four rows and we double-click one of them off to hide it, all four of the rows will be hidden. If we select three rows and then press the Move Down arrow button, all three rows will move down. For example, suppose we select all rows where the column width is 96 points. We double-click into the first such selected row to change the width of the column to 72 points. The moment we press Enter to accept the edit, all of the selected rows will have their column widths also changed to 72 points and the width of the columns in the table window will be adjusted. The usual selection moves and keyboard shortcuts work. Ctrl-A to select all, Shift-Ctrl-A to unselect all, Ctri-I to invert the selection. 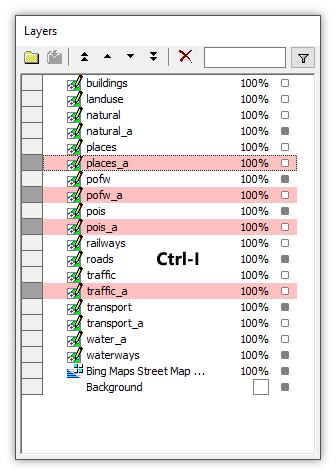 Ctrl-click on a row to toggle it selected or unselected. Ctrl-click on a row to select it and then Shift-ctrl-click on another row and all the rows in between will also be selected. 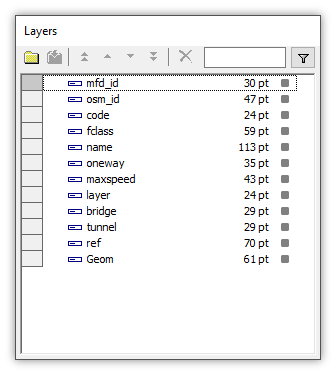 Saving a project will save current Layers panel settings for a table. Query results tables are virtual tables in that they are constructed on the fly to show the results of a query. To make them permanent we would use SELECT ... INTO to create a real table. 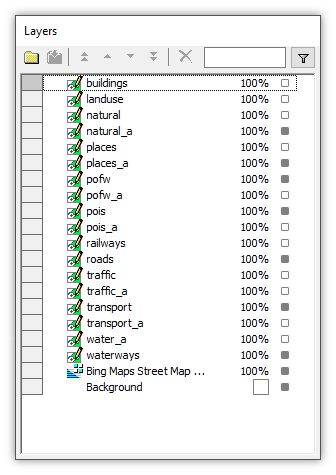 However, for more effective browsing of results tables we can use many display features such as the Layers panel and Filters with query results tables. 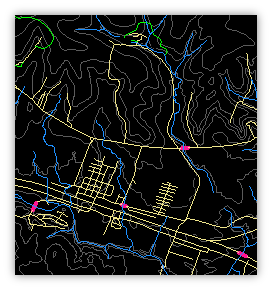 For example, in the illustration above we have altered settings in the Layers pane to hide the mfd_id field in the results table and we have adjusted widths of columns. Such settings go away with the next run of the query but they are so quick to specify they can be very convenient when browsing a complex results table. 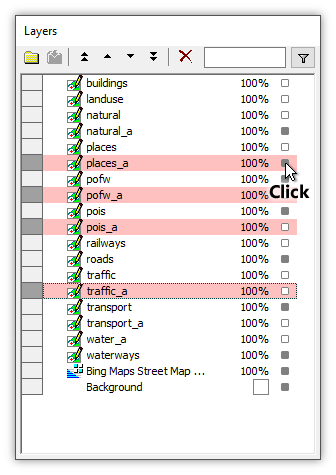 For example, if we are only interested in two fields out of twenty in a results table, we Ctrl-click on those two fields in the Layers panel to select them, we Ctrl-I to invert the selection, and we double-click any of those selected fields OFF to hide all eighteen of the selected fields. That is a very quick way to hide all but two fields in a results table, taking but three seconds for an experienced Manifold user. 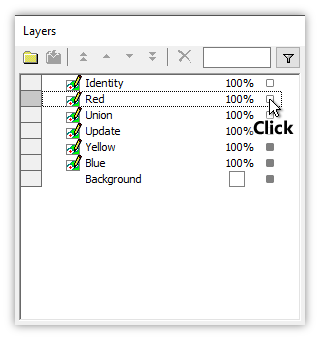 The Layers panel shows a check box to turn the Background color on and off. The Background is not a real layer in that it does not correspond to any drawing, image or labels layer in the context window. The Background shows what color to put underneath all other layers. By default white, we can change it by double-clicking into the color well and we can turn it on or off for display like the other layers. Changing the background color to a color other than white allows us easily to see if any white space in the window is part of the background or not. See the Example: Layers Tutorial topic. 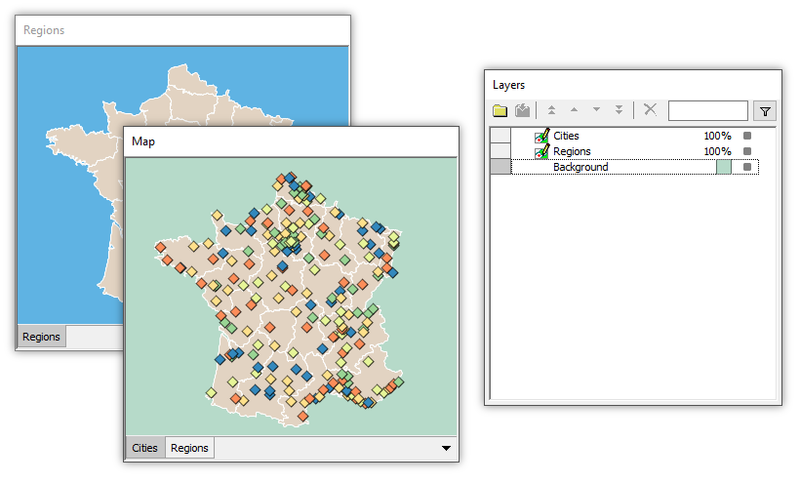 Consider a map with two layers as seen above, a Cities layer of points and a Regions layer that is a drawing of regions as areas. By default the Layers panel uses white color for the background. We can change the background color to a different color by double-clicking into the background color well and changing the color to any desired, such as the light green color seen above. Double-clicking the Background layer turns off background color, showing the default checkerboard pattern that indicates transparency. Background is a property of a specific component when opened in its own window. Each individual component can have its background color set to some color different than the default by opening the component in a window and setting background color in the Layers panel. The background color specified for a component applies whenever the component is opened in its own window, but not when the component participates as a layer in some other window. For example, we can double-click open in its own drawing window the Regions drawing used as a layer in the example map earlier in this topic. 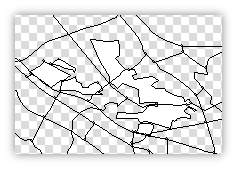 The Layers panel shows one layer for a drawing window until other layers are added to the window. The background color by default is white. 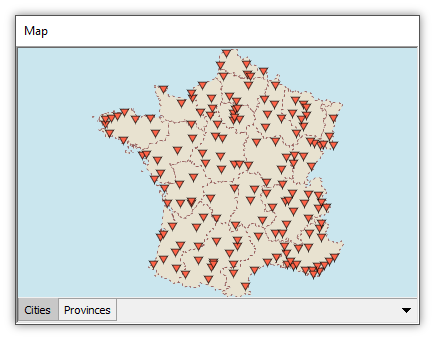 Just as with a map, double-clicking the Background layer turns off background color, showing the default checkerboard pattern that indicates transparency. We can double-click into the background color well to change the background color for the drawing to a blue color as seen above. Changing the color for a drawing's background is a temporary measure that will apply only when that drawing is opened in its own window and only for as long as that window is open. 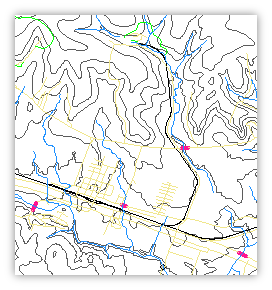 It will not apply if the drawing is used as a layer in a map and will not be saved with the drawing. 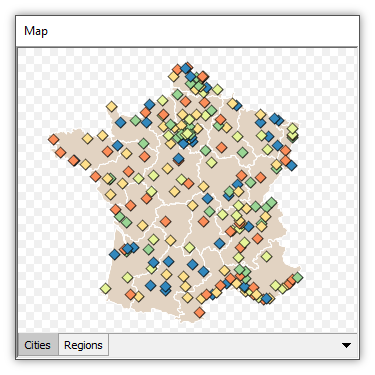 Only background colors specified for maps are saved with the map. 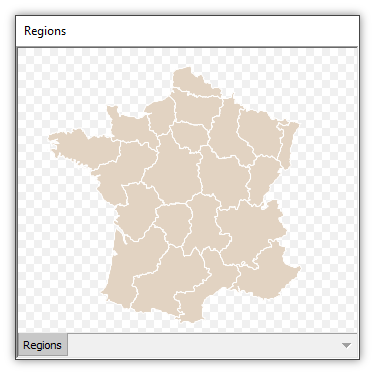 For example, we can open the Regions drawing in its own window at the same time that it is used as a layer in a map window. 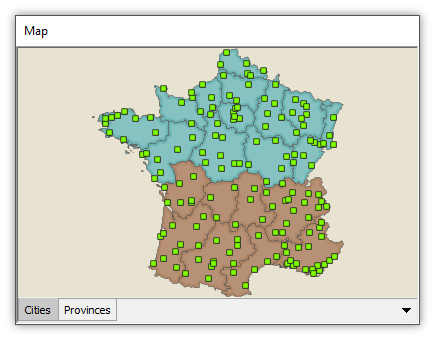 With the focus on the map window, the Layers panel shows the background color specified for the map, a light green. 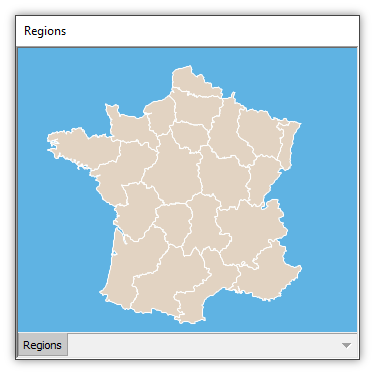 The blue color used as a background for the Regions drawing does not carry over into the map. Changing the background color can dramatically change the appearance of a window. The following three illustrations below show the effects of changing only the background color from the default white, to black to green. It is important to consider background color when using Style to choose colors for objects in drawings. In the illustrations above a white background hides the yellow road lines while a black background hides the black line used for a railroad. The formatting shown above was intended for use with a green background color, and not with white or black background. 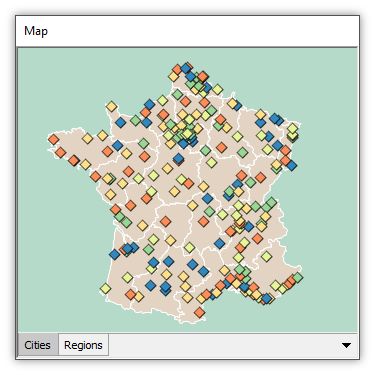 It is obviously a bad idea to use the same background color as used by objects in a map. See more examples in the Example: How Not to Format a Drawing topic. Besides the practical aspect of not using a background color that is the same as a color used for objects in a drawing, the choice of background color can have a big aesthetic effect. The background color set by the Layers panel can dramatically change the look and feel of a visual display, as seen below where different formatting using the Style panel is combined with different choices of background color in the Layers panel. The objects in all three examples are exactly the same. 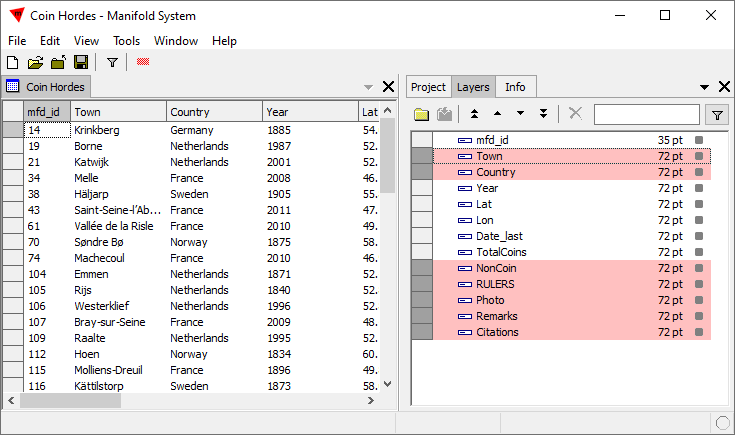 Read-only data - The Layers pane recognizes when the data it displays is read-only, and disables controls and commands that cannot be used with read-only data. Temporary layouts and temporary maps are always writable. 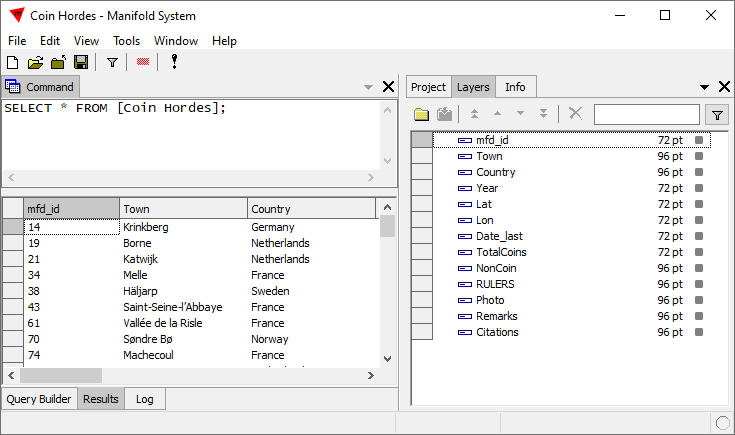 Tables and queries always appear writable with changes to tables on read-only data sources being kept in the window and being discarded after the window is closed. Widths in printer's points - Why are the widths of columns in tables specified in printer's points as a unit of measure? Tables display values using fonts that are specified in printer's points, with displays and printouts normally scaling to show those fonts in reasonably accurate real-world sizes. Setting the width of columns using the same units of measure allows table column sizes to scale the same way as the fonts they contain. Example: How Not to Format a Drawing - When using Style to format a drawing it is a really bad idea to use the same color for objects that is used for the background color. It can also be a bad idea to use transparent color for objects. This topic illustrates why.